Peri Schwartz dodges nimbly between representation and abstraction. 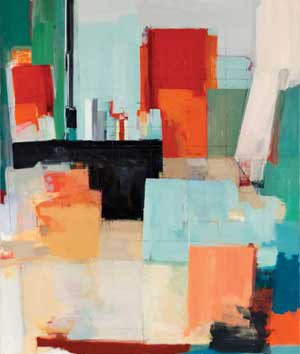 Her paintings at Gallery NAGA depict interiors of her own studio, which melt into planes of pungent color. “Studio XXXV” feels more about the artist’s choices than it is about any objective reality: hovering swatches of tangy orange and icy blue, a clean black block, its top streaked with verticals. Perhaps they’re book spines. Schwartz uses every patch of color to build a sense of space, yet the patches themselves look flat and deliciously smeary, as if on her way to pictorial depth, she fell in love with a particularly bright and sensuous dollop of paint. Schwartz’s work is sunny and spacious.